WASHINGTON — Fans hoping to commemorate the Caps win in a unique way may want to consider shelling out $900 for a 3.5-foot-tall Alex Ovechkin bobblehead. If Ovechkin doesn’t do it, there are also 42-inch versions of T.J. Oshie or Tom Wilson, a release from the The National Bobblehead Hall of Fame and Museum said. Perhaps $900 is a little steep for a bobblehead —The museum is offering 8-inch versions of more than half the roster for $35. 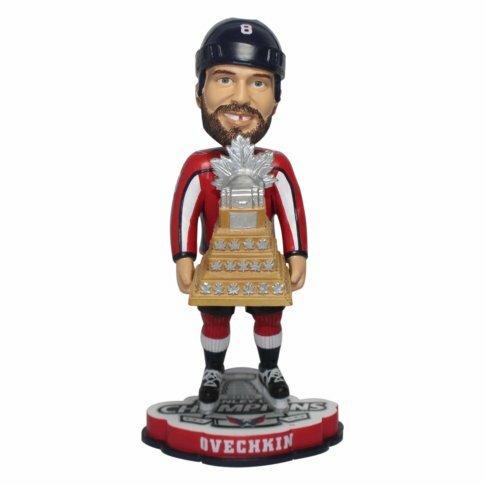 Those interested in figurines of Ovechkin hoisting the Conn Smythe Trophy are on the hook for an extra $5. The whole team in bobblehead form, plus 3.5-inch miniature versions of Ovechkin, Oshie and Wilson, can be purchased for $525 plus a flat $8 shipping fee, the release said. The museum itself was announced in November 2014, and hosted a preview exhibit in 2016, the release said. It is currently setting up its permanent Milwaukee location, and is slated to open in summer 2018. The bobbleheads are licensed and produced by manufacturer FOCO and should ship by October. “Capitals fans will be able to remember this magical season forever with these bobbleheads, which will become cherished collectibles for Capitals’ fans of all ages,” said Phil Sklar, co-founder and CEO of the National Bobblehead Hall of Fame and Museum. An entire lineup of bobbleheads — including many non-Caps items like an elf and Pittsburgh Steelers wide receiver JuJu Smith-Schuster riding a bicycle — are available on the museum’s website.